For the last five years, we've been bringing The Energy Gang podcast to New York City. We're coming back on October 4. Every year the show sells out — and we've only got a handful of tickets left. Get yours now. 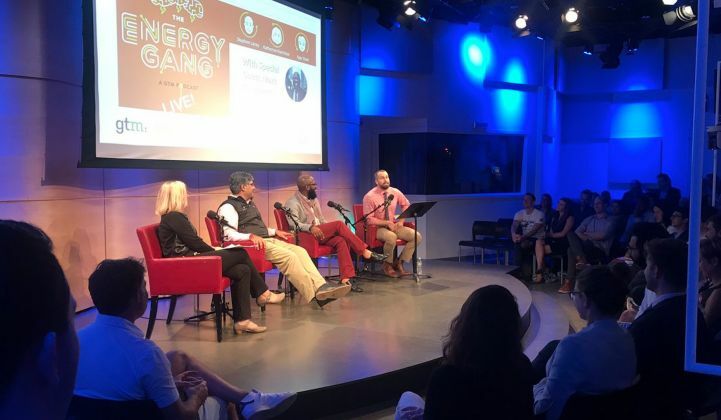 Once again, we're partnering with Clean Energy Connections to tape a live version of the podcast at WNYC's performance studio in Lower Manhattan. The venue offers an intimate setting with superb audio quality, making it our favorite place to record and interact with fans of the show. This year, we'll be joined by Eric Roston, the sustainability editor at Bloomberg. Our big theme: How do we judge progress? We'll examine a range of good and bad indicators. By many accounts, humanity has made progress on almost every major economic indicator. Despite the craziness in politics, clean energy is thriving in the U.S. and around the world. But we're not even close to grappling with climate change. How should we think about these simultaneous realities? We'll debate.